Logitech is promoting entertainment technology in “Robot”, a television commercial featuring a robot hoping to relax after a stressful day at work. Nothing goes right at work. The computer shorts out, the printer eats his project, and he can’t even get a candy bar out of the machine. This bad luck follows him home as his cellphone won’t get service and his car breaks down. Once home all is fine however, with all Logitech products working just fine. 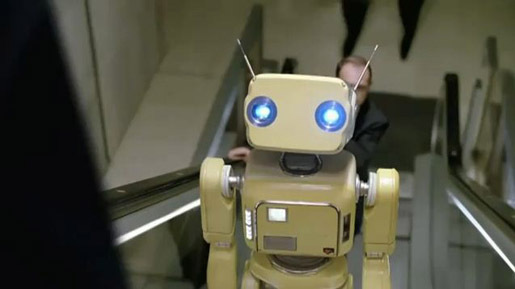 The Robot campaign was developed at Goodby Silverstein & Partners by creative director Rich Silverstein, executive creative director Margaret Johnson, group creative director David Kolbusz, art director Jack Woodworth, copywriter Spencer Riviera and agency producer Jennie Lindstrom. Filming was shot by director Simon McQuoid via Imperial Woodpecker with director of photography Jan Velicky, line producer Anita Wetterstedt, with production designer Martin Krejzlik at Unit + Sofa, Prague. Editor was Kim Bica at Arcade Edit with assistant editor Dean Fazende, producers Ali Reed and Heather Kirsten. Telecine was produced at Company 3 by colrist Sean Coleman. Visual effects were produced at Ring of Fire by executive producer/VFX supervisor John Myers, creative director Jerry Spivack, VFX producer Casey Conroy, VFX assistant producer Candace Niikura, online editor/Flame artist Shelly Dutcer, Flame artists Brian Schneider, Brian Petras, Tony Graf, Marla Carter, Mark Devlin, rotoscoping team David Dang and Inga Stanelin. Graphics were produced at Gentleman Scholar by creative directors Will Johnson and Will Campbell, animator/designer Paul Yeh, executive producer Rob Sanborn, and producer Tyler Locke. Puppetry effects were produced at Legacy Effects by effects supervisor Alan Scott and effects coordinator Robert Ramsdell. Audio post production was done at Eleven Sound by audio engineer Jeff Payne. Sound was designed at Soma. Music was produced at Asche & Spencer by creative director Thad Spencer.